Sending love and solidarity to coastal Alaskan communities after reading this recent article from The Guardian. It has been a while since the last update, but only because we are working tirelessly. 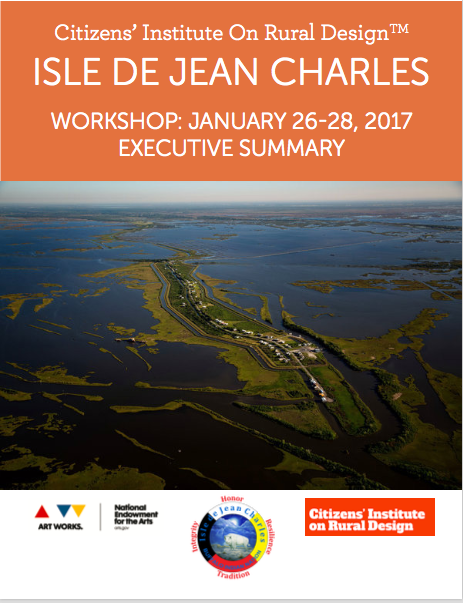 In January the Isle de Jean Charles band of Biloxi-Chitimacha-Choctaw and Dr. Alessandra Jerolleman of the Lowlander Center coordinated a two-day tribal center planning workshop in partnership with the Citizens' Institute for Rural Design. 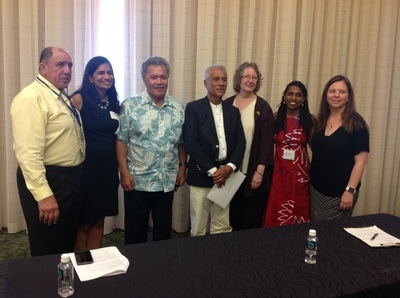 Read the executive summary of the workshop here! Sending love and encouragement to the people of Shishmaref, Alaska, whose residents recently voted to resettle their community due to permafrost erosion there. We wish them the best. As part of a student thesis project, Guillaume Mercier and three other students at IHECS (Brussels, Belgium) will work on the environmental situation, and environmental migration in Louisiana. The project takes the form of a 26-minute TV report and will be presented in January 2017 in front of professors and professionals. A major part of their time in Louisiana was spent with coastal communities directly affected by sea level rise and land loss, and their story highlights the ways that Louisiana can set an example for the rest of the world. The challenges that Louisiana is facing today, will be the same challenges that the world will have to work with in the next decades. Hopefully the solutions will be useful elsewhere too! 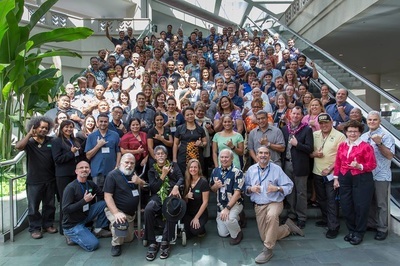 It's been over a month since our last update, and we have been very busy with multiple community meetings, Rising Voices, Natural Hazards Workshop, and more! 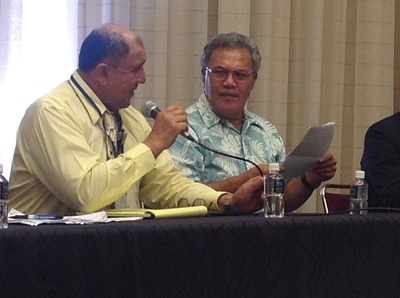 We will let you know more details on the progress of the resettlement in the coming weeks. In the meantime, please review the Union of Concerned Scientist's new Framework and Principles for Science-Based Adaptation. Below is a prayer written by Father Mark Pranaitis from Catholic Charities. 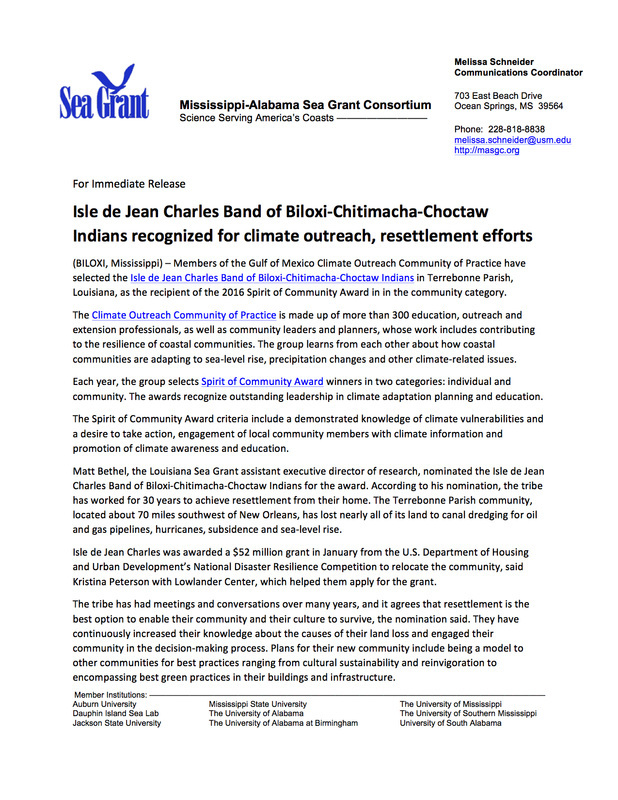 Father Mark blessed the Tribe as they embarked on a series of meetings with federal agencies and participated in a U.S. Congressional Forum on Climate Re-settlement in DC this past May. We are so grateful to have the support of Father Mark and Catholic Charities on this journey. 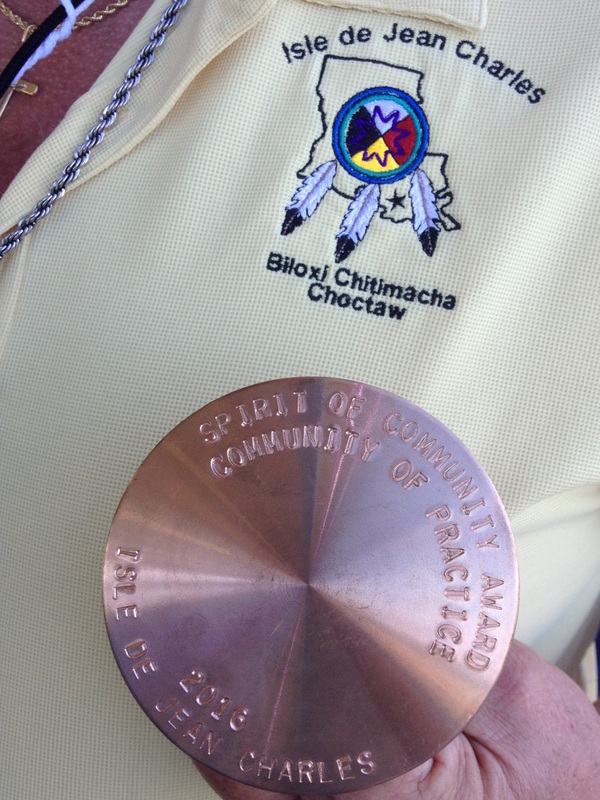 Lowlander Center's Dr. Shirley Laska will present on the Isle de Jean Charles band of Biloxi-Chitimacha-Choctaw Tribal Resettlement this afternoon at the State of the Coast Conference in New Orleans. House Natural Resources Committee Ranking Member Raúl M. Grijalva (D-Ariz.) will held a forum on climate refugees, titled “Confronting a Rising Tide: The Climate Refugee Crisis,” on May 17 at 2 p.m. on Capitol Hill. 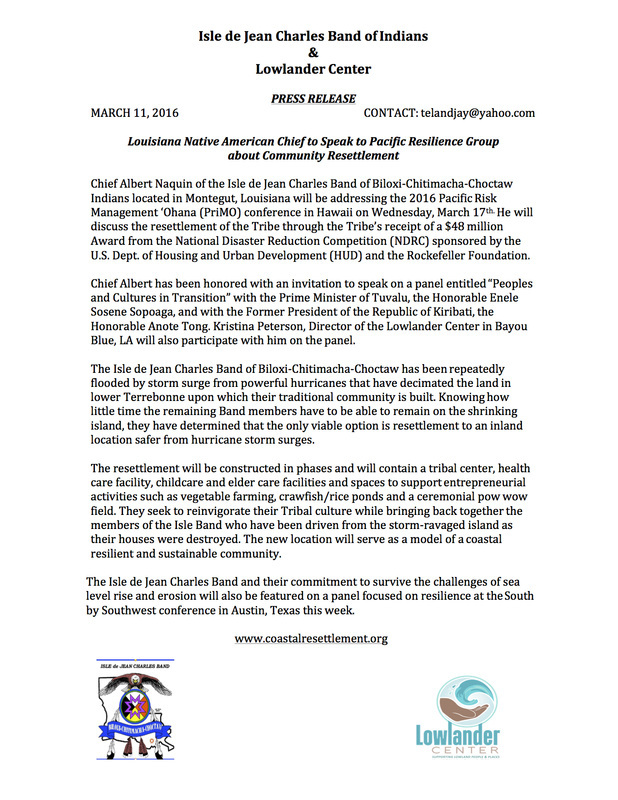 According to scholars in attendance, the Isle de Jean Charles Band of Biloxi-Chitimacha-Choctaw Re-settlement was a topic of discussion and inspired hope at the Displacement Solutions roundtable last weekend in Geneva. Looking forward to hearing more from what sounds like a productive meeting! 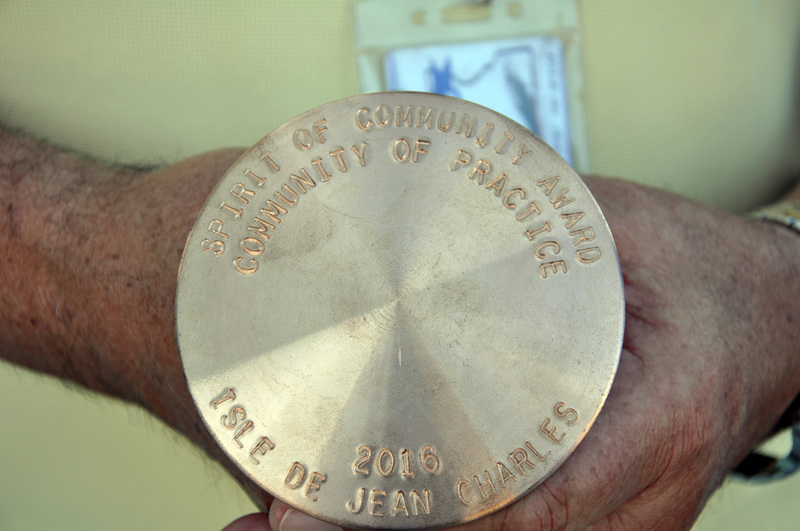 Congratulations to Chief Albert Naquin and the Isle de Jean Charles for being awarded the Spirit of Community - Community of Practice Award from the National Oceanic and Atmospheric Administration (NOAA) Mississippi-Alabama Sea Grant Consortium!!! We are always learning! Internationally-renowned displacement and resettlement expert, Anthony Oliver-Smith, has written this piece on the Ethical and Moral Principles of Resettlement. 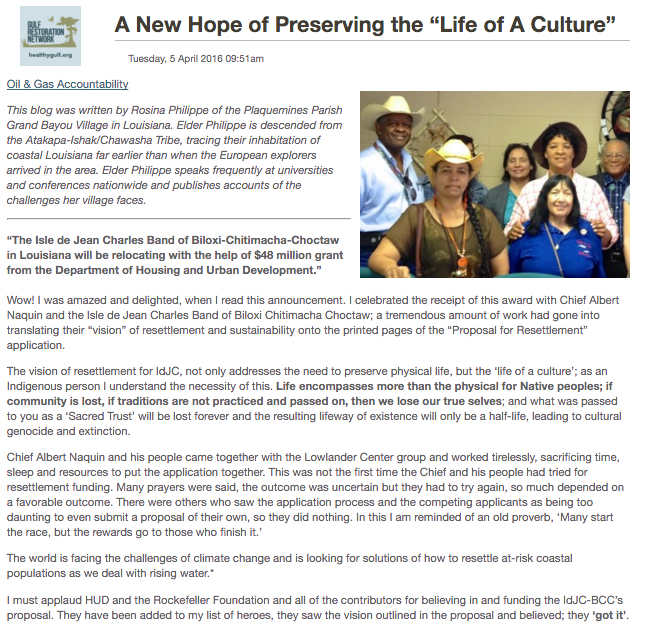 Incredible words of support from Elder Rosina Philippe from Grand Bayou! 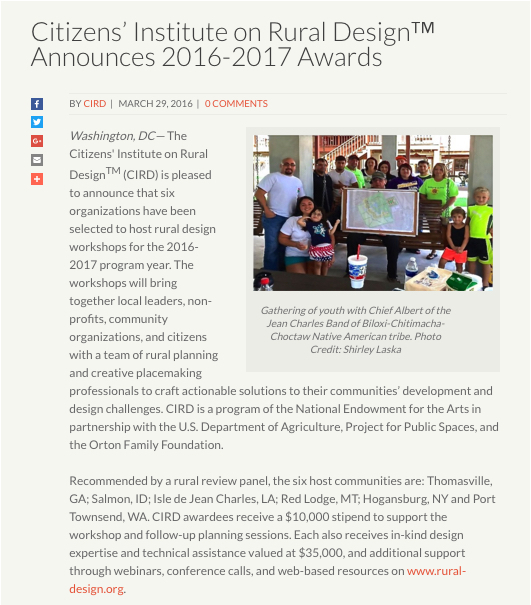 ​Isle de Jean Charles receives $10,000 plus $35,000 in-kind design expertise from the Citizens’ Institute on Rural Design to hold a rural design technical workshop during 2016-17. ​We are honored to be invited to update the world on our project at the 2016 Pacific Risk Management 'Ohana (PriMO) conference on Wednesday. Please see the press release below. Thank you for your ongoing support! community that brings along the families, the culture and the ways we had been sustainable and resilient to build into the new framework, we will have honored our ancestors and brought a gift to our future generations. There are going to be many more communities like us, not wanting to move but know they will have to eventually do so. 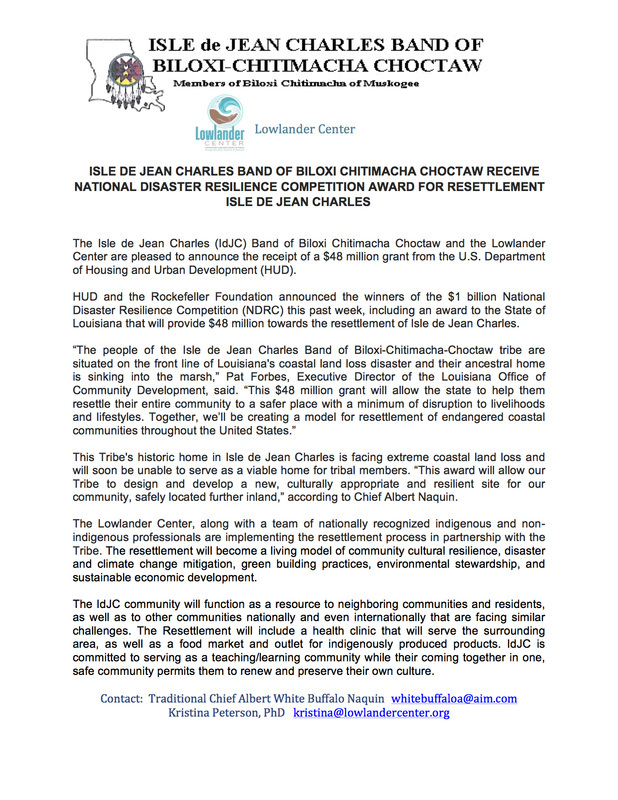 We are committed that this gift – opportunity given the Isle de Jean Charles Tribe of the Biloxi Chitamacha band will help serve as a learning/teaching model for others." ​Incredible news! Our community resettlement project has been selected as part of HUD's National Resilience Competition. See below for more information!